Karen Peteros holds up a tray of honeycomb from her urban beehives. There’s a buzz in San Francisco. It can be heard in parks, on rooftops and in ordinary backyards. People are donning bee suits, installing hives and collecting their sweet rewards. It is evidence the urban beekeeping movement has taken up residence in San Francisco. A few years ago, the association numbered 75 amateur beekeepers. Today the group boasts a stirring hive of more than 200. Inspired by the spread of Colony Collapse Disorder, a mysterious ailment that has wiped out colonies of bees across the country, a new generation of beekeepers have dragged a piece of rural farming into the urban landscape. Even in dense San Francisco, hives have sprung up in unusual places. Liz Murray climbed a metal ladder to the roof of her Haight-Ashbury apartment building. Dressed in a white bee suit, she pointed to the stack of hives she keeps on her rooftop. In many ways, Murray is the face of the modern beekeeper, who is increasingly younger and female. “People want their vegetables close to them,” Murray said. 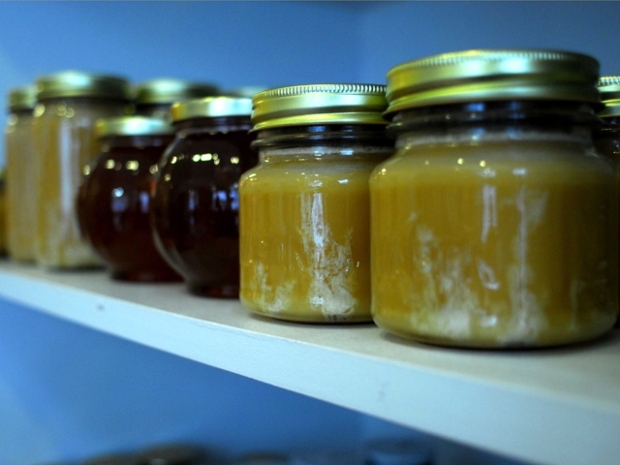 “A lot of people want organic product.” Murray collects honey from her hives and pours it in jars affixed with her own label. In San Francisco’s Golden Gate Park, a secluded, gated area is set aside for community beekeepers to store their hives. On a recent Saturday, Mortensen and several other keepers inspected a group of troubled hives. “There’s evidence in some of the cells where the bee was trying to come out and it’s just frozen in place,” said Mortensen pulling a honeycomb from a hive. A swarm of bees landed on his protective mask. “Now, because America is greening and because Mrs. Obama has two hives on the White House lawn, everybody wants to do it,” said Tim Muhrlin who manages the collection of community hives. The growth of amateur beekeeping has also given birth to a new commercial market for homemade honey. In the Mission District, former tech worker Cameo Wood recently opened a store called Her Majesty’s Secret Beekeeper to serve the new market. The sleek-looking store sells beekeeping supplies, cosmetics made from beeswax, and beeswax candles. A large wooden shelf is filled with jars of homemade honey from various San Francisco neighborhoods. Wood said honey from each neighborhood is influenced by the flowers and fruit trees of the area. San Francisco attorney Karen Peteros has a backyard filled with beehives – a stack of old hives and honeycomb sits in her living room. She makes honey infused with Meyer lemons from her tree and teaches classes on beekeeping. “The honey bee, for the first, has really gotten the kind of acknowledgment of its value to our agricultural systems and eco-systems,” she said topping off a jar with honey. Peteros said a recent national survey showed the average age of a beekeeper was 55 or older. But she believes that is changing. “I think what we’re seeing in the urban environment is a younger group of people and predominately female as well,” she said. The beekeeping movement is in perfect sync with the themes of a DIY culture that is increasingly demanding foods grown closer to home. But limitations on space and commitment means not everyone will be throwing on a beekeeper outfit anytime soon.